Headmaster Arthur Sheriff, one of the school’s greatest assets, came to The Cheshire School from Yale in 1915. He became dean of students in 1920 and headmaster in 1923, a post he held until 1966. In 1937, Sheriff saw the school become Cheshire Academy, retaining its small, challenging classes and strong teachers. After World War II, Cheshire Academy became one of the few schools to help returning veterans receive their high school diplomas. The present Horton Hall was donated to the school by the government as housing for these men. Many classes had students from sixteen to twenty-three years old mastering calculus and foreign languages together. Headmaster Arthur Sheriff retired and was succeeded by Dr. Arthur Griffin, John Vance, James Crosby, Dr. Ernest Beaulac, and John Hyslop. Cheshire Academy celebrated its bicentennial in 1994 with a large alumni celebration. Roberto C. Goizueta ’49, CEO of Coca Cola was guest speaker. In 1999, Dr. Gerald Larson was named headmaster. Under his leadership, a new dormitory (Motter Hall) and headmaster’s residence (The O’Connor House) were constructed, the Richmond Health Center was renovated, the John J. White ’38 Science and Technology Center was opened, and a new Library and Humanities Building was completed. 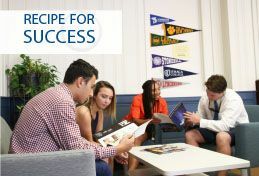 In addition, there was a recommitment to the student-centered education which has been the core of a Cheshire Academy education for over two centuries.